To me, there is nothing that says summery get-together more than a jug of something cool and delicious. There are endless combinations to be tried and tested, everyone has a favourite flavour and level of sweetness, and I hope at least one of these combinations tickles your fancy. I like to work with the basic equation of fruity+sparkling+/-booze+ice+/-bitstoeatwithyourfingers = punchy perfection. All measurements below work for jugs that hold 1.5 – 2L of deliciousness. Fill your jug with as many icecubes as you can because it is 41C outside and your aircon is broken. Use the very pretty icecubes you have been making with borage and watch as the pretty flowers float about in your drink and taste like cucumber. Slice up your cucumber in whatever way you like. I am partial to long thin strips but do what feels best and chuck that in the jug. If you have some mint, add that in there too. 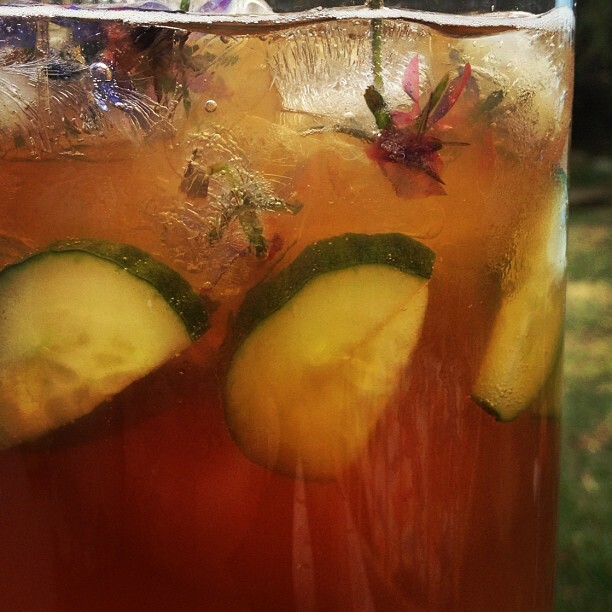 Pour in the Pimms. I’m not going to lie to you – I have no idea how much we usually use – enough so that it tastes like Pimms? We probably had a good inch and a half to two inches in our 2 litre jug (then we added more after tasting). Top with ginger ale (lemonade if you must) and drink. Sit back and reflect on a job well done. Cut pomegranate in half, over a bowl (or straight into your jug) tip the pomegranate cut side down and WHACK the outside repeatedly with the back of a wooden spoon until 95% of the tiny jewel-like seeds have popped out. Tear the pomegranate apart to remove the remaining seeds. Repeat with other half. Remove any pith. Into the jug pour the pomegranate seeds, alcohols and cordial. Mix gently and allow to sit in the fridge for up to 2 hours to chill/infuse. Just before serving, add ginger ale and sparkling mineral water and mix gently. Top with ice. Drink! Enjoy getting sticky red fingers while trying to fish the seeds out of the bottom of your glass. This was our Christmas Punch this year and it made us all quite jolly! Start dreaming of an island holiday after you see a pineapple on the bench and tin of juice in your pantry (so fancy). Find umbrellas from hilarious party your housemate held 4 years ago. Get idea! Peel zest from one lime, muddle with the brown sugar in the bottom of the jug. Add juice from this lime to jug. Slice remaining lime into thin slices (try not to cut your finger at this point, citrus juice is not your friend if you do). Add slices to jug. Pour in all remaining liquid ingredients, stir gently. Top with ice. Sit outside with a giant fan, sunscreen and hat, sipping this out of some kind of ridiculous glass with an umbrella and oversized garnish of pineapple and cherry.